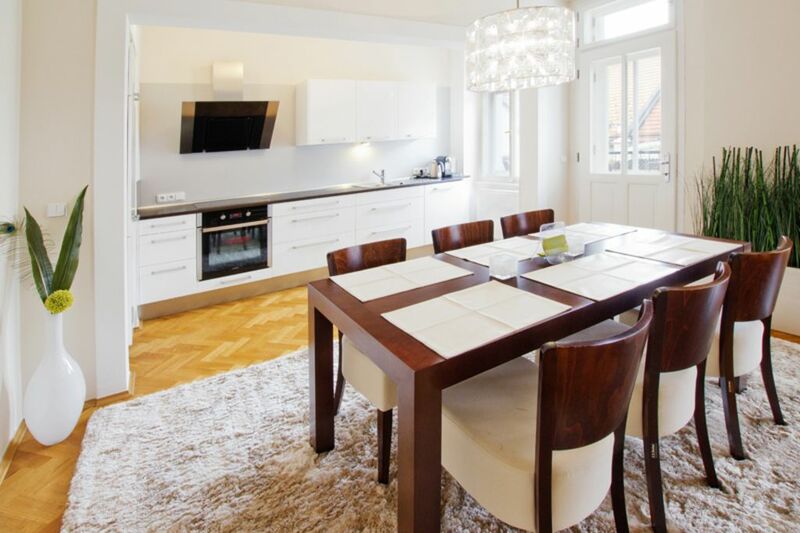 This charming 2 bedroom apartment has the luxury of 2 bathrooms and air conditioning. Together with its balcony overlooking St. Vojtech church and its brilliant location just 6 min from the Old Town sq and Charles bridge this apartment is ideal for people seeking central location, comfort and quiet. Nestled in the Old Town, this beautiful and spacious 4th floor apartment boasts 2 separate bedrooms with a separate living room making it ideal for 2 - 3 couples. The apartment also has 2 separate bathrooms for more comfort. The apartment was fully renovated in January 2013, and has all new furniture. The kitchen is fully equipped with oven and 4 top stove, fridge, freezer, dishwasher, microwave, toaster and coffee maker. The living room is fully equipped with flat screen satellite TV, DVD player, stereo and has high-speed WiFi internet. There are couple of couches for relaxing, dining table and unfold able double couch bed. The two bedrooms are spacious and comfortable, each with a double bed and storage capabilities. Both bathrooms are spacious with toilet, bathtub and shower. The whole apartment has central heating and also gets great light. The apartment also has air conditioning for the hot Prague summer months. Pstrossova street is in the heart of Prague's historic Old Town. The apartment is just meters from the National Theater and the Charles Bridge is only 6 min away which is also the same distance to the Old Town Square. The trams and metro stop Mustek is also just a few minutes away which means that you have easy access to everything to see in Prague. Start your day with a coffee and fresh pastry followed by an early morning walk across the Charles Bridge to avoid the crowds. It's real magic.There are tons of cafes, restaurants, bars, shops and everything else you could want as you are in the middle of Old Town. Try the famous U Bubenicku pub for the real Czech cuisine and more importantly the beer which is located a block away. Buy your fresh produce and basic supplies just down the stairs (in the same building) in one of the local grocery stores and for more complex shopping you can go to the large Tesco supermarket just 2 blocks away from the apartment. The beauty of this part of Prague of course is the fact that you are in the center but on a quiet side street which gives you easy access as well as quiet. Centrally located, but quiet means you can relax but also reach any landmark within minutes. The castle is just a 20 minute walk or hop on the 22 tram and go 3 stops circa 7 minutes. The apartment is also 7 minutes away from the busiest shopping street Na Prikope with brand name products like Hugo Boss, Benetton, Next, Mango, Zara and Ecco to name a few. There is also a massive, modern shopping center - Paladium just a few hundred meters away. For those travelling with children you can also take them to the Hamley's toy store if you need to appease the little ones. There is also a modern multiplex movie theater showing most films in English with subtitles. If you are interested in the arts you are just 100 meters from the prestigious National Theater which runs great performances in the baroque setting year round. The national Opera House is just a 15 minute walk up Wenseslas Square. In terms of dining you can choose from the cream of the crop to the best of the budget in this area. One tip for people not wishing to spend an arm and a leg for lunch is to pop in to Havelska Koruna for an affordable and tasty Czech meal in a cantina style. Price around 6 USD for a soup, main and drink. There are other wonderful restaurants such as Mlynec, Botylda, Cihelna and Grossetto Marina to name a few - all within easy walking distance. You are just blocks away from the hip and trendy Buddha Bar Prague - built in an old cabaret club. There are sports bars in the area for those wishing to watch their favorite sports. We really recommend this location. Quiet neighborhood, great little corner market next door, many very good neighborhood restaurants and just steps away from useful tram lines (22 and 17). Also walking distance to everything in Old Town and the Charles Bridge and Little Quarter. The apartment is spacious, very clean, with as comfortable a bed as we have ever had when traveling. The kitchen is nice, though no food or condiment items are provided, not even sugar or salt. We understand the owner is concerned with allergens, but this is a negative for those who like to do some cooking. There are two bathrooms, one spacious with a window, but a slippery deep tub and a hand shower, the other small, no window, fan (a bit noisy) but a good shower. However, there isn’t a place to put soap and shampoo except on the floor. We would definitely return here if we are ever fortunate enough to visit beautiful Prague again, despite these minor shortcomings. The location, space, comfortable bed and terrific little balcony make up for the other issues. We also recommend that you use the car service from the airport. Vladimir is very nice and helped get the luggage into the small elevator and showed us around the apartment. We really loved Prague. We hope you do too. Great property in a fantastic location. The south facing balcony is a nice feature. The apartment was very modern in a quiet location. It had all the features and facilities you need and expect. 1 There is only one Scart lead into the TV which means you have to change this from the Sattelite box to the DVD. The instruction card in thus incorrect. 2 The lift door on level 4 does not always close. This need looking at. Thank you for taking the time to write a review. We appreciate all feedback and will look into the issues you have raised. I am glad that you enjoyed your stay and your visit to Prague. Our family of 6 (mom & dad and our 4 teenagers) enjoyed our stay in this lovely apartment! It was very spacious and had everything we needed. It was in a wonderful, quiet, safe location that was within walking distance to everywhere we wanted to visit. Management (particularly Petra) was fantastic at communicating /answering all our questions. We loved our stay here and highly recommend this apartment for your stay in Prague! Thank you for taking the time to write a review. I am so glad you enjoyed your stay and your visit to Prague. Very nice apartment with a balcony. Good location. Vladimir was very nice and helpful. Thank you so much for the kind words and I am really glad you enjoyed the apartment and your visit to Prague. Thank you so much for the positive review, I am glad you enjoyed your stay and visit to Prague. Please note that stays during our Top Season (Christmas and Easter) are for a minimum of 7 nights and due to the extreme high demand we require a 50% deposit in advance.